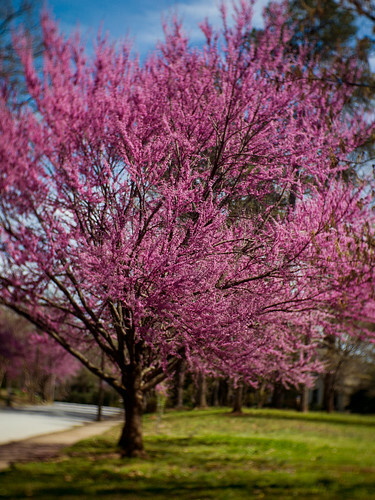 On 17 March 2019, these magnificent dogwoods —in the Sycamore Street neighborhood of Decatur, Georgia— were in the pink, seemingly celebrating the start of spring. They were three days early. The actual Vernal Equinox —when winter became spring, astronomically— occurred Wednesday at 5:58 pm Eastern Daylight Saving Time. (That's Atlanta, Georgia time. Your time may vary.) At that moment, the Sun crossed, from south to north, directly above the equator. In other words, at that moment there was no tilt of the Earth's axis in regard to the Sun. For our friends south of the equator, the March Equinox marks the end of summer and start of autumn. The moon also rose that evening of the Equinox, full (aka the Worm Moon) and 'super' (its closest approach to the Earth). That's a phenomenon that last occurred in spring 1905 and won’t occur again until 2144. Year to year, due to the inexactness of the modern calendar and because Earth's elliptical orbit is continually changing its orientation relative to the Sun, the date varies from 19 through 21 March. And, it isn't true that on that day, there are equal amounts of daylight and dark. It's close, but not quite. In practice, that means that Easter is always the first Sunday after the first full moon that falls after March 21. Thus, Easter can occur as early as 22 March or as late as 25 April, depending on when the paschal full moon falls. The swirly bokeh diorama-like effect of the photo was produced in camera via an adapted tiny CCTV lens. Pic(k) of the Week: one in a weekly series of photos taken (or noted) by me, posted on Saturdays, and occasionally, but not always (as is the case today) with a good fermentable as the subject. Camera: Olympus Pen E-PL1. Lens: Fujian 35mm ƒ/1.6 CCTV II cine lens.